BACKGROUND: Acute onset vomiting and diarrhoea is one of the most common illnesses of infancy, and is second only to respiratory illnesses as a cause of childhood deaths worldwide. Existing guidelines for management of diarrhoea are often ignored in public and private practice, possibly because of a perception that the guidelines are too simple, or because of expectations of the need to give 'real' drug therapy to stop diarrhoea. OBJECTIVES: This guideline provides a problem-based approach to the basics of present-day management of acute gastroenteritis, and discusses the evidence for the recommendations. 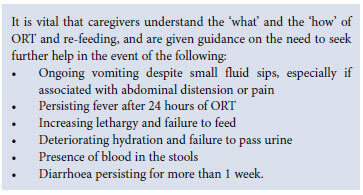 RECOMMENDATIONS: Each episode of diarrhoea must be seen as an opportunity for caregiver education in the prevention of the illness, in the 'what' and 'how' of oral rehydration and re-feeding, and in the recognition of when to seek help. The vast majority of patients recover rapidly, but serious complications do occur and must be recognised and managed correctly. VALIDATION: The guidelines are endorsed by the Paediatric Management Group (PMG) in South Africa. CONCLUSION: The aim of management is to help the child to maintain or regain hydration, and to recover from diarrhoea, with careful attention to adequate oral rehydration and judicious re-feeding. Acute onset vomiting and diarrhoea is one of the most common illnesses of infancy. Caused by acute infection with a variety of viruses, bacteria and parasites, the condition is easily recognised by caregivers and is usually managed at home. Numerous traditional and folk remedies exist, owing to the common and well-recognised nature of the condition; these might have been tried before the child is brought for medical attention. In this era of highly prevalent HIV infection, it must be remembered that each episode of acute infective diarrhoea may occur in a patient with unsuspected pre-existing HIV infection; each healthcare contact should be an opportunity to establish the child's HIV status for optimal management.  Provision of safe water for drinking and food preparation.  Proper hand-washing hygiene after toilet use and before food preparation and feeding.  Safe disposal of human and other waste. In view of the frequency and importance of the condition, best practice guidelines for management of diarrhoea have been published by the World Health Organization (WHO),7,8,9 American Academy of Pediatrics (AAP),10 and European Society of Paediatric Gastroenterology, Hepatology and Nutrition (ESPGHAN),11 among others. The use of these guidelines has been described in numerous countries;12,13 however, they are often ignored in practice, more frequently than those for other paediatric conditions such as asthma.14,15 Reasons for this include doctors' unwillingness to be imposed upon, failure by doctors to keep pace with changing views on hydration and nutrition, a perception that the guidelines are too simple, and parental expectations of 'real' drug therapy to stop diarrhoea. 3. Acute gastroenteritis: what are the problems? Vomiting is largely attributed to local factors and poor gastric emptying, and should not be treated with antiemetic drugs.16 Cyclizine and prochlorperazine have not proven useful and may carry a higher risk of toxic side-effects in young infants, and in the presence of dehydration. Ondansetron is moderately effective,17 but the cost and quantity required for a clinically significant effect negates general recommendation. Abdominal pain is usually spasmodic due to disordered motility, or is associated with colitis in dysentery. Metoclopramide should be considered in severe pain, at a dose of 0.1 mg/kg of body mass to a maximum of 10 mg; a total daily dose of 0.5 mg/kg should not be exceeded.16 The extrapyramidal side-effects of metoclopramide in young infants should warrant caution. Frequent small oral sips of a clear hypotonic glucose-containing fluid correct ketosis and prevent gastric overdistension, in addition to contributing to rehydration. In early gastroenteritis, solids or foods with a high protein, fat or fibre content slow down gastric emptying and may aggravate vomiting. Substitution with a clear, hypotonic fluid may result in earlier cessation of vomiting. Diarrhoea is the manifestation of secretion/absorption disturbance and disordered motility: a symptom of damage already done in the infected gut. Antidiarrhoeal medication is not advised. Antidiarrhoeal formulations aim to reduce intestinal motility, reduce secretion of water and electrolytes, and adsorb fluid and toxins, thereby reducing the number of stools seen in the diaper; however, none treat the cause of diarrhoea or actual pathology, and their use may be associated with more side-effects in young children than in adults. Furthermore, adsorbents (e.g. kaolin) hide the true extent of water loss, risking underestimation of the amount of fluid required for hydration in severe diarrhoea. Antibiotic therapy is not indicated in the majority of cases caused by viral infection.18 In bacterial infection, antibiotic therapy generally does not shorten the length of diarrhoea, except when administered early in the case of dysentery (ciprofloxacin for 3 days is recommended).7 Rather, antibiotics are required to prevent or limit the spread of infection to others (e.g. early in cholera), and should be prescribed for evident parenteral infection (e.g. urinary tract infection or otitis media). Dehydration is the main acute risk of acute gastroenteritis. Watery stools develop as a result of a secretion-absorption imbalance of the gut mucosa; however, glucose-linked sodium absorption with secondary water uptake is maintained even in secretory states like cholera. This is the basis of oral rehydration therapy (ORT). Hypotonic fluids with a sodium content of 45 - 65 mmol/l (e.g. Rehidrat, Sorol) allow more rapid rehydration than fluids with a higher sodium content,29 but hypertonic sugar-based drinks with little sodium (e.g. cola and sports drinks) may result in osmotic aggravation. A home-made salt-and-sugar solution (SSS) (half a teaspoon of salt plus 8 teaspoons of sugar per litre of water) is useful, but of unpredictably variable concentration, and is therefore best used in the early stages before dehydration has set in. Dehydration occurs because fluid loss exceeds fluid intake. In general, signs of dehydration lag behind water loss. The best guide to the risk of developing dehydration is the frequency of watery stools: assuming a deficit of 10 ml/kg of body mass for each watery stool. This amount of fluid should be offered to the child in addition to usual fluid intakes. Initially, the emphasis is on maintaining fluid intake despite vomiting, offering feeds according to tolerability. Small frequent liquid feeds are better tolerated than large volumes or solids. Feeds should be followed with clear hypotonic fluids such as SSS, or even dilute juices or mildly sweetened tea - as much as the child wants, in small quantities. Commercial rehydration fluids are also suitable. Taste may be an issue in the case of anorexia or vomiting; caregivers may need to be creative in adapting or hiding the taste of rehydration fluids. Once the child shows signs of dehydration, ORT takes precedence over feeding. The clinical signs of dehydration are variable;30 the degree of dehydration is most accurately predicted with a combination of the observer's experience,31,32 the measured acute weight loss, and the presence of metabolic acidosis.33 Placed together, these allow an assessment of whether dehydration is mild, moderate or severe. In particular, capillary filling time must be noted: a capillary refill time (CFT) >3 seconds in a dehydrated child indicates the need for intravenous resuscitation in addition to rehydration. Initially, an isotonic solution - such as Lactated Ringer's or Normal Saline - should be chosen for resuscitation. If the circulation has improved after 1 - 2 boluses of 20 ml/kg, given rapidly, the fluid can be changed to a rehydration fluid such as half-strength Darrow's solution with 5% dextrose, at a rate of 10 ml/kg/h. If the circulation has not improved after the second bolus, a third bolus of 20 ml/kg should be started, with transfer to hospital for intensive monitoring and care. 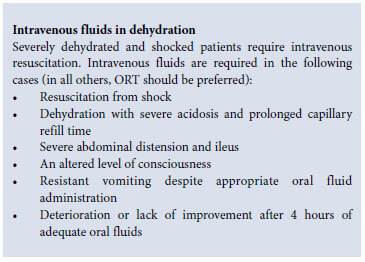 Patients receiving intravenous rehydration must be reassessed regularly, as the fluid administration rate may require adjustment, up or down, depending on the rate of improvement and ongoing loss. ORT achieves faster rehydration and is associated with fewer admissions than parenteral rehydration.34,35 A hypotonic solution is recommended with a 45 - 65 mmol/l sodium content, approximately 2% glucose (111 mmol/l), and potassium and bicarbonate or citrate for alkali replenishment. Commercial rehydration solutions comply with these recommendations. Oral rehydration solutions, provided in small frequent sips by teaspoon at a rate of 15 - 25 ml/kg/h, avoid gastric distension and vomiting. Manuals such as the Integrated Management of Childhood Illnesses,8 the South African Essential Drugs List (Hospital Level, Paediatrics) and the WHO Manual on the Management of Diarrhoea,9 provide recommended volumes of solutions to be given per hour. Most children are able to rehydrate within a few hours before they are ready to commence with small feeds. In the face of ongoing diarrhoea, extra fluids must still be offered for thirst and prevention of further dehydration. These occur because of the loss of sodium, bicarbonate and potassium associated with watery stools. The electrolyte status of patients with severe diarrhoeal dehydration, circulatory disturbances or metabolic acidosis should be ascertained.  Metabolic acidosis is almost always present if the patient has significant dehydration, and is identified by more rapid deep respirations with a clear chest on auscultation. Unless metabolic acidosis is severe, sodium bicarbonate is usually not required, as rehydration allows for correction. Rehydration fluid contains alkali in the form of citrate or bicarbonate. A wide anion gap may suggest the possibility of severe ketosis, salicylate intoxication or lactic acidosis.  Large amounts of potassium are lost in diarrhoeal stools. Metabolic acidosis is associated with further urinary potassium loss. In acidosis, a shift of intracellular potassium to the extracellular compartment results in a spurious elevation of the serum level, despite intracellular potassium loss. All children suffering from severe diarrhoea should receive oral potassium chloride: 125 mg 8-hourly if under 1 year of age, and 250 mg 8-hourly if over 1 year of age, until dehydration and acidosis are corrected.  Sodium disturbances occur frequently. Sodium content of the stool water varies from plasma-like in secretory diarrhoea (such as cholera), to very low in pure osmotic diarrhoea. In general, serum sodium is inversely related to the state of the intracellular water compartment, i.e. raised serum sodium reflects intracellular dehydration. Hypo-and hypernatraemia management should follow recommended guidelines; however, where ORT is possible, the process of rehydration usually allows metabolic homeostasis to be re-established.  Blood glucose disturbances occur in severely ill young children as a result of glycogen depletion with lack of intake, or in association with the stress response of dehydration. Blood glucose estimation should be performed by finger-prick test in all dehydrated children.  Age- infants under 3 - 6 months of age may be expected to have more severe intestinal injury from gut infection.  Type and site of infection - viral diarrhoea involves the mucosal villi and can be expected to affect digestion and absorption, while toxigenic diarrhoea (e.g. cholera) does not affect the mucosal structure. Infection in the upper small gut affects digestion and absorption more than that in the colon.  Pre-existing medical condition that affects the patient's recovery (e.g. HIV).  Pre-existing nutritional state and lack of breast-feeding - malnutrition results in predisposition to mucosal atrophy, and superimposed gut infection increases the risk of maldigestion (e.g. lactose intolerance). In a well-nourished child, infection-induced mucosal damage may recover rapidly without a need for modified feeds.37,38 Once rehydrated, the child's usual feeds should be reintroduced. At first, it may be necessary to give smaller volumes more frequently to avoid vomiting; the diarrhoea may continue for a short while. Initially, the child may be unable to take full feeds and may lose weight, but the aim is to achieve full-volume feeding within 1 - 2 days. There is no need to dilute or otherwise modify the usual feeds, provided that they are tolerated. Breast milk is a hypotonic fluid that can be utilised simultaneously for hydration maintenance and feeding; breast-feeding should continue and even be increased during diarrhoea. Other milk formulas should not be used to hydrate the patient because of the high solute load, but after recovery from diarrhoea, extra food should be offered for nutritional recovery. In malnourished children, acute gastroenteritis may be more severe, and recovery may be delayed. Greater vigilance is needed in suspecting possible maldigestion and malabsorption. Children should be monitored until full recovery from diarrhoea and resumption of weight gain. Persisting diarrhoea (longer than 2 weeks after acute onset diarrhoea) is a more serious condition; it is associated with nutritional deterioration and much of the mortality from diarrhoea.39,40 Small intestinal mucosal injury or bacterial overgrowth should be suspected and diagnosed by appropriate means if: (i) the persisting diarrhoea is associated with weight loss and a continued need for rehydration fluids; (ii) the child is under 6 months of age or is malnourished, or (iii) a complication such as lactose intolerance exists. Feed modification and substitution is usually required in a planned stepwise progression. Acute diarrhoea is predominantly a problem of fluids and feeding - both being heavily dependent on the caregiver's understanding and reactions. The aim of management is to help the child to maintain or regain hydration, and to recover from diarrhoea. With careful attention to adequate oral rehydration and judicious re-feeding, acute infective diarrhoea should not be a frightening condition to caregivers. Endorsement. The guidelines are endorsed for publication by the Paediatric Management Group (PMG) in South Africa.